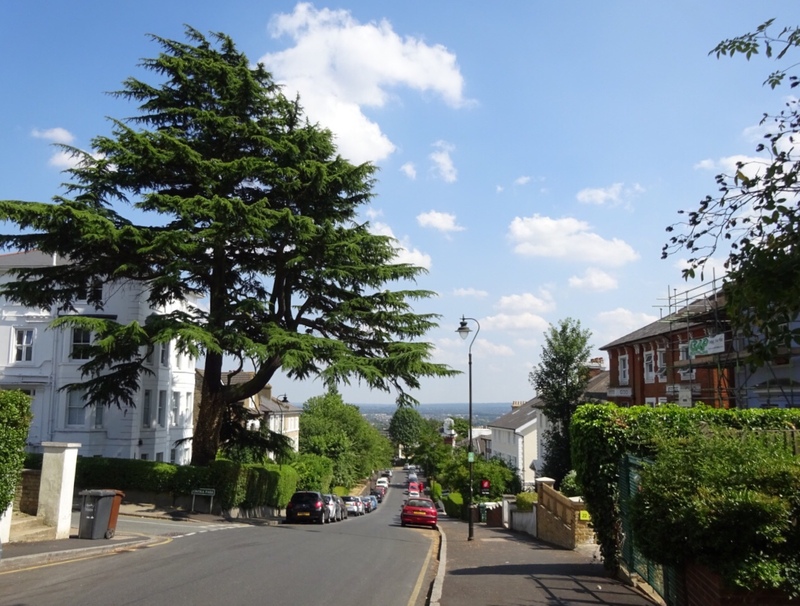 As we have seen with a couple of streams in the Pool catchment, Pissarro’s Stream and Wells Park Stream, the high land above Sydenham was covered in woodland known as the Great North Wood. Another of these streams is Penge Stream which had several sources just to the south of Crystal Palace Park. It was visible in William Faden’s map of 25 miles around London (on a Creative Commons via the Library of Congress) was surveyed in 1790 (above). The valley tumbles down through the gardens between of Milestone Road and Anerley Hill towards Cintra Park, here the valley is clear, a pronounced dip in Cintra Park, below. Cintra Park was also a confluence of streams, one of the other sources is close to the ridge and Belvedere Road. 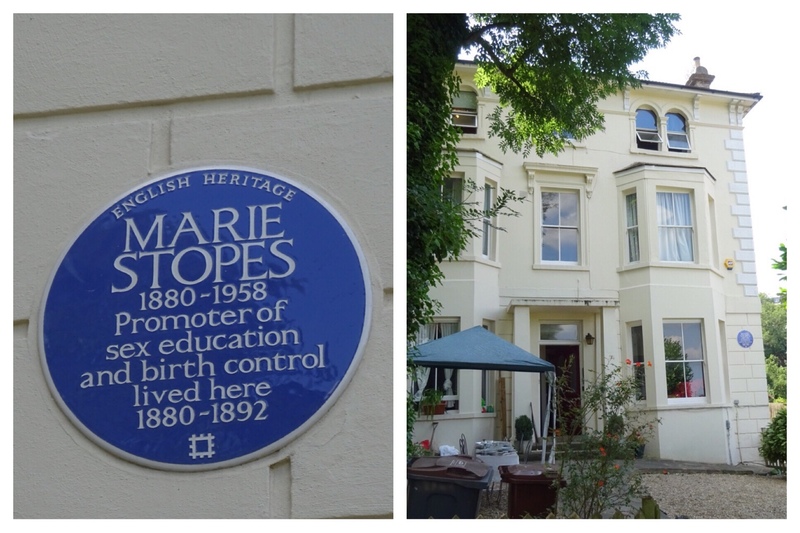 The branch runs almost due east, passing the blue plaqued home of Marie Stopes at 28 Cintra Park – while she made major contributions to plant palaeontology and coal classification, and was the first female academic on the faculty of the University of Manchester, she is better known for founding the first birth control clinic in Britain, despite her opposition to abortion. Below Cintra Park there is another dip on Playdell Road and a further one on Palace View, with each terrace further down the hill, the valley flattens out a little. There is one of the several small, fluvially eroded switchbacks on Anerley Hill just below the road leading to Crystal Park station – here there would have been another small confluence with a stream that ran between houses in Waldegrave Road – it’s course is clear a little further upstream too, with a small dip in Belvedere Road (just below the junction in the picture below). The Stream, for much of its original course, was crossing Penge Common; most of which was enclosed with the Croydon Enclosure Act of 1797 and the Penge Enclosure Acts in 1805, 1806, and 1827. To the north of Anerley Hill, contours were slightly confused by the railway line approaching Crystal Palace station but the former course would have taken in through the former Bromley Council housing of Lullington Road – some sold under Right to Buy, the remainder owned by Clarion Housing, the current name of what was once Broomleigh, the housing association all of Bromley’s stock was transferred to. 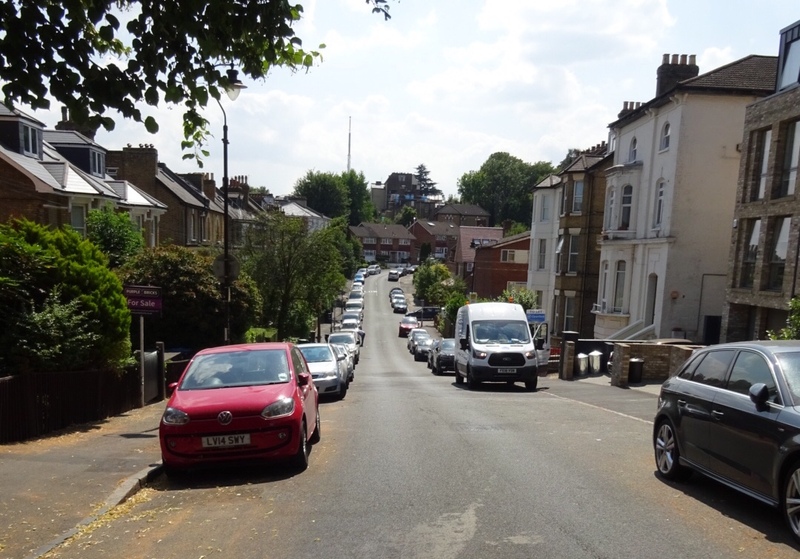 Lullington Road (Lillington Road on the 1863 surveyed Ordnance Survey map) is on the site of Victorian housing that was developed soon after the arrival of the Crystal Palace. 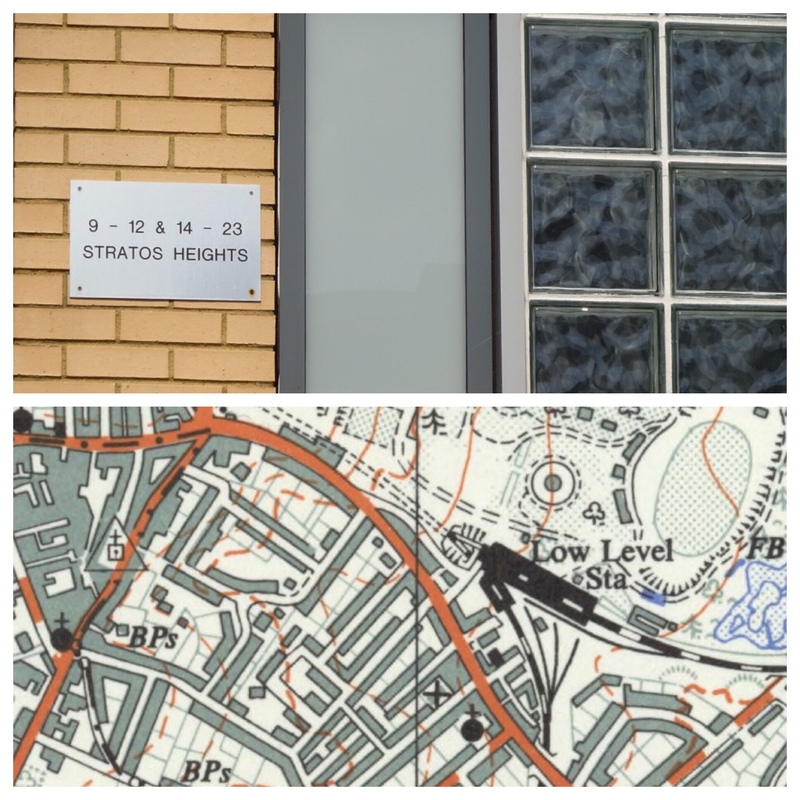 The mention of Battersea below it is not a cartographical error by early Ordnance Surveyors, rather, as was covered in the post of the River Willmore, Penge was for centuries an outlier of Battersea. Downstream the stream would have crossed the current Thicket Road before traversing the contour hugging Anerley Park (once home the the leading Victorian cyclist George Lacy Hillier). The curvature was the result of the road following the former Croydon Canal – a short stretch still remained into the 1860s. Assuming that the stream was still flowing at the time the canal was built, it may well have drained into it. Later Ordnance Survey map contour notches suggest another stream joining around this point – while the cartographical route is clear, it’s former route lacks clarity on the ground. On the other side of the canal replacement service, the railway, Penge Stream crosses Oakfield Road, there is a no doubt fluvial eroded depression close to Woodbine Grove. 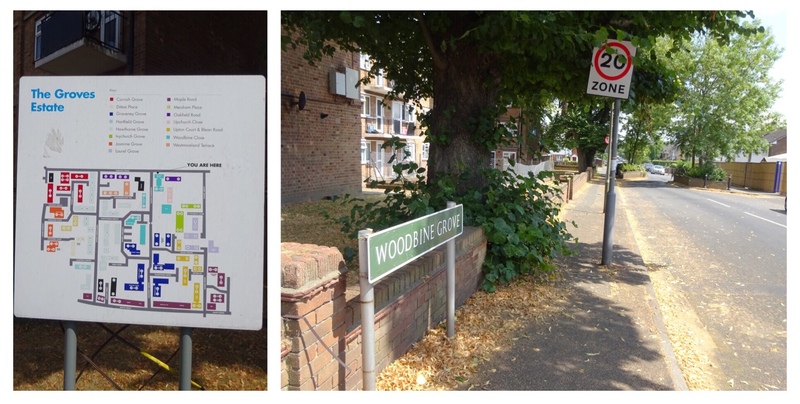 Woodbine Grove is and was part of the Groves Estate – first built in the mid 19th century and redeveloped by Penge UDC, then London Broough of Bromley in the 1960s. Around here, another small stream would have joined just behind the Pawlene Arms; while it’s contour lines are obvious from Ordnance Survey maps, although slightly less so on the ground – there are hints of a depression mid way along Howard Road, parallel to Maple Road, and its neighbours, but tracing it back upstream it peters out well before Anerley Road. The once larger stream would have probably flowed now not so Green Lane, joining another stream flowing from the northern side of Crystal Palace Park and making a confluence with the Willmore (also known as Boundary Stream, Boundary Ditch and Shire Ditch) around the junction of Kent House and Parish Lanes – this is not completely clear though, the confluence may have been with the Pool itself around Cator Park school. The Environment Agency 100 year flood risk map, whilst relating to surface water is helpful in tracking former streams as storm flows will often follow the courses of former or hidden watercourses due to the small valleys that have been created. This is shown above for the entire course of Penge Stream, but potential flows become somewhat confused around Penge’s High Street. Here, as with the rest of the course of the stream, there is no evidence of Penge Stream still flowing – at no stage was there either any water or the tell-tale sounds of water flowing under man-hole covers. While the course is clear, it seems that like many of the other streams that flowed from high up in the Great North Wood, Penge Stream is lost to changes in the water table or Victorian surface drainage (probably the former). Ordnance Survey map credits – all are from the National Library of Scotland on Creative Commons – the top 1960s and the bottom from 1863. This entry was posted in Rivers and tagged Anerley, Anerley Hill, Battersea, Boundary Ditch, Boundary Stream, Cintra Park, Crystal Palace, Great North Wood, Marie Stopes, Milestone Road, Penge, Penge Stream, Pissarro's Stream, Playdell Road, River Pool, River Willmore, Shire Ditch, Wells Park Stream on March 21, 2019 by Paul B.